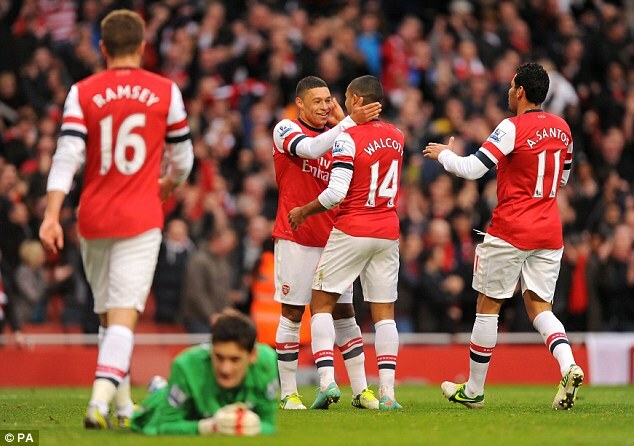 Arsenal 5-2 Spurs: Santos hated the homoeroticism between Theo and The Ox, and was always quick to break it up. If you follow my Twitter account, you’ll probably know that I’m a chef by trade, and I spent the game yesterday glued to 5live whilst preparing a wedding breakfast. As it turned out, the bride and groom had opted for a Spurs-themed day, with each of their tables using the name of ex-Spurs muppet – table 1 was named ‘Ginola’, for example. As fate would have it, underneath my chef whites I’d chosen to wear my Arsenal shirt. I took great pleasure in parading around in it whenever the opportunity arose – I even prompted some colourful language from a very bitter and dubious individual. The past few weeks as an Arsenal supporter have been pretty bloody awful. We needed a tonic – something to perk us collectively up, and drive those miserly thoughts away for the time being. Boy, did we get it. I’m not going to put too much gloss on the performance. Defensively we were still some distance from looking like a reliably secure unit, and it speaks volumes for our recent form that I was nervous at 4-2 with 15 minutes to play. However, I don’t really care about those frailties today. I’m not going to pretend they aren’t there, but given the glorious, glorious nature in which we dispatched those mouthy second-stringers and their gob-shite support, I’m more than happy to forget about them. Looking back on derby day, performance counts for very little. The result is everything, and we got a belter. Many of the players had a bit of fight about them – especially Jack Wilshere who was particularly incensed with Adebayor’s red card challenge, and rightfully so. Giroud, Mertesacker and Podolski all celebrated their goals with passion, and played as if they knew how important the game was to everyone who follows Arsenal. Most impressive on the day was Santi Cazorla. The little fella simply oozes class and ability. Whenever he got the ball, he prompted our best moves and he has an abundance of guile and creativity to his play. I just love watching him – I could happily sit through a 48 hour video of his career highlights and worry later about sleep deprivation. Yesterday he was magnificent, and comfortably my man of the match. Walcott also looked good, and he has another goal and assist to add to what is a very impressive tally when you consider his paucity of starting appearances. His contract saga is certain to rumble on and on until a resolution is found at the last minute. The more he plays, the more improvement and end product I see in his game, and, even if I may not be his greatest, most vehement advocate, I’m honest enough to admit he is steadily changing my opinion of him. I hope he signs on the dotted line, and that improvement continues in an Arsenal shirt. That’s all for today, folks. The comments provide you with a welcome avenue for positive thoughts and words of cheer. Use them, if you would be so kind. Scheduled for 5-2, love it! as a gooners, of course, last night was one of the greatest match for me, and as usual, when Arsenal win, I go to all highlight, and watch the highlight again and again…. For last match performance, I want to highlight 1 condition, I hope this is not right…. I wonder, when Giroud scored, Cazorla the assist-giver, just went to the left, not celebrate it with the others, and when Cazorla scored, Podolski also not celebrated it with Cazorla, what happen with them ? I think we won because two Andres were on the bench. A game like that is the reason an American like me loves the arsenal. Because that’s the way arsenal play, and when we play like that, we’re unstoppable.